Dr. Josh Cutter MA.OsteoMed – Osteopath – Registered osteopath and member of the Australian Osteopathic Association. 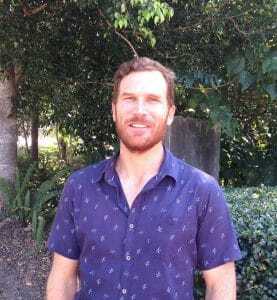 Josh completed a three year Bachelor of Clinical Science (Human Structure and Function & Osteopathy) and a two year Master of Osteopathic Studies from Southern Cross University Lismore and has lived on the Gold Coast for 20 years. He has worked in clinics on the Gold Coast and the Northern Rivers. He is a father of one child and has a wide sporting background including climbing, surfing, and martial arts. Josh was drawn to osteopathy after suffering from chronic lower back pain due to a spinal fracture. After personally experiencing the benefits of osteopathic treatment and exercise advice Josh was inspired to study osteopathy in order to help others find relief from pain.He enjoys helping others to recover from injuries so that they are able to enjoy life to the fullest. He combines hands-on treatment and advice and utilises techniques such as soft tissue massage, muscle energy techniques, joint manipulation, strain-counterstain, and myofascial release. He aims to improve the optimal function and abilities of his patients at home, at work, and in their sporting and leisure activities. He has completed various post graduate studies including courses in chronic pain relief and stretching techniques. He predominantly uses a structural model for treatment of musculo-skeletal conditions to effect change in the body, and offers advice on exercise, diet and lifestyle to provide a complete service for his patients.